Extensive on-site inventory is available of factory-direct fuses and accessories that carry a manufacturer-backed warranty. This is different from many other sources that provide surplus or re-conditioned fuses, both that can introduce potentially harmful risk in an electrical circuit. 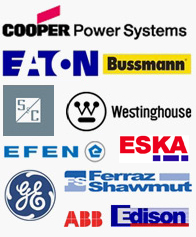 Our Factory Warranty fuse brands include Eaton Electrical’s Cutler Hammer formerly Westinghouse, Ferraz Shawmut, S&C Electric, Efen, Siba, Bussmann, Littelfuse, Cooper Power Systems, General Electric and several other European fuse brands. In addition to carrying many specialty products, Norberg~IES can build custom mountings for fuses. This means both that fuses and associated mountings can be customized onsite to your specific application - both shipped quickly in order to meet your needs.